Pretty sweet logo, whoever designed that must be pretty much the best person in the world. 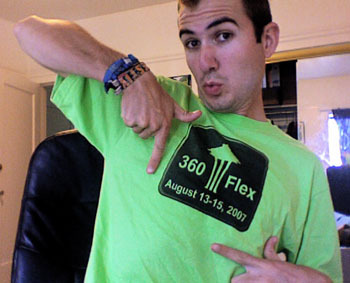 Get your 360|Flex stuff here. And if you haven’t registered for 360Flex, do that here. 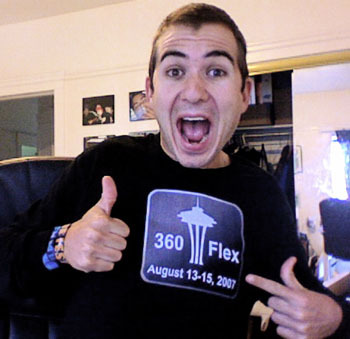 In response to the 360Flex badge on the 360Flex blog, and the one from polyGeek, here's my 360Flex badge. No joke, I just got this shirt in the mail from my dad. Thanks Dad. LOL Definitely the logo maker is THE best person in the world, quite possibly even the UNIVERSE!!!! Rockin’ dude! We can sport our skittle green shirts in Seattle!